Ok, I finally finished completly new (from scratch) tool for chapters. This is completly different than my previous qpfilegen tool. BIG Thanks goes to jdobbs who helped and share part of code, the application is no longer dependent on eac3to, it have own Blu-Ray/HDDVD/DVD support. -ADD: Drag & Drop support, for files and disc folders. -ADD: DVD IFO parser is now mediainfo. -FIX: Little bug in DVD/IFO parsing code. -FIX: x264 output now work as introduced in r1764 no more -1 in lines, so this practically is not compatible with pre r1764 versions of x264. So update your x264. -FIX: I be forced to use ChapterXtractor as DVD IFO parser because my IFO code goes crazy, until i not fix it, ChapterGen will use ChapterXtractor for DVD or IFO source. It's a little slower and Chapterxtractor window will flash many times but 100% working. -FIX: a little bug in HDDVD parsing code. Last edited by shon3i; 27th July 2011 at 10:56. Cool! I look forward to experimenting with this. shon3i, you are a genius. Thanks for that tool. Especially for convert fps. @buzzqw thanks, i working on fix but i need more time than i expected to fix this, i think i need to rewrite whole IFO parser ASAP. with your cmd i get "cannot open input file" message because you must specify full path to file including filename, for input and output files. I will fix that in next version. hmm it's realy strange, here at home i can't reproduce this. Can you please take a screenshot of error to see what is possible reason. I use same cmd and put VTS_02_0.IFO in same folder as ChapterGen.exe, and everything is fine? shon3i thanks very much for this tool, and particularly the CLI option. With my custom .cmd file, makes easy work of making qpfile and tsmuxer files! Many thanks shon3i for this app. Especially for the fps conversion capability. Just hours, minutes and seconds, no cents and no line breaks, and the separator is a comma. Would you consider adding this format? Ok, no problem, can you send me a sample of chapterlist? ChapterGen output without chapters="" would be just fine because I normally use a template for the XML file where I could just paste the chapter points between the quotes. Any chance export to xml file for use with mkv containers will be added? For DVDAuthor compatible output I made a little workaround myself in the meantime. 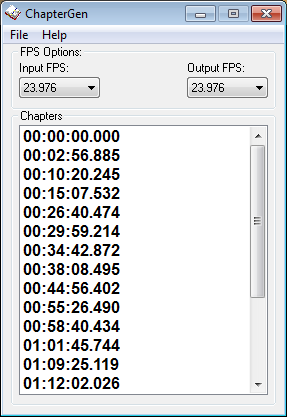 A small batch file converts a Sonic Cinevision CSV file (using sed for Windows). REM  to a DVDAuthor compatible Chapter file. REM  convert on this shortcut. sed -e ":a" -e "$!N;s/\n/,/;ta" -e "P;D" temp.txt >"%1"
CHAPTER18NAME=Do We Have an Order? Stupid me! I meant HD DVD version of Serenity. Let me know what I need to upload to reproduce the problem. Thanks.